The history of Guinness World Records began at a shooting party in Ireland in 1951, when the managing director of Guinness Brewery, Sir Hugh Beaver, found himself in an argument about whether or not the golden plover was Europe’s fastest game bird. He looked for a book that would give him an authoritative answer, could not find one and thought it might be a good idea if one existed. The athlete Chris Chataway was working for Guinness at the time. He recommended the twin brothers Norris and Ross McWhirter, who had both won blues as sprinters at Oxford and were running a publishing company and fact-finding agency in London. Norris McWhirter was the announcer at the track in Oxford in 1954 when Roger Bannister broke four minutes for the mile, which gave a fresh boost to the whole subject of records, and Guinness duly commissioned the book. Over the years, the book has combined meticulous accuracy with an enormously broad reach. It spread beyond sport, engineering, science and technology, the arts and entertainment to include wonderfully bizarre information. All record claims are solemnly checked and authenticated by Guinness adjudicators located around the world. 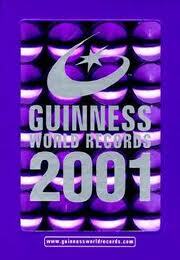 Guinness World Records continues to be a best-seller today. 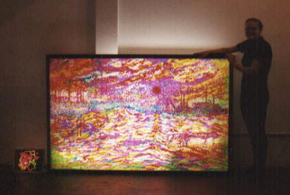 In 1999, Lori Kanary became a Guinness record holder when she created Giant Lite-Brite as part of Denver's city wide celebration of the Denver Art Museum's European Impressionism exhibit. As seen from a child's view of the world, Lori's larger than life version of the toy inspired a new Guinness World Record, utilizing 62,856 actual toy Lite-Brite pegs. The image “Impression Sunrise” by Claude Monet, tied into the citywide Impressionism theme. To see Lori's Record Lite-Brites, click the book covers below.